I bike everywhere. 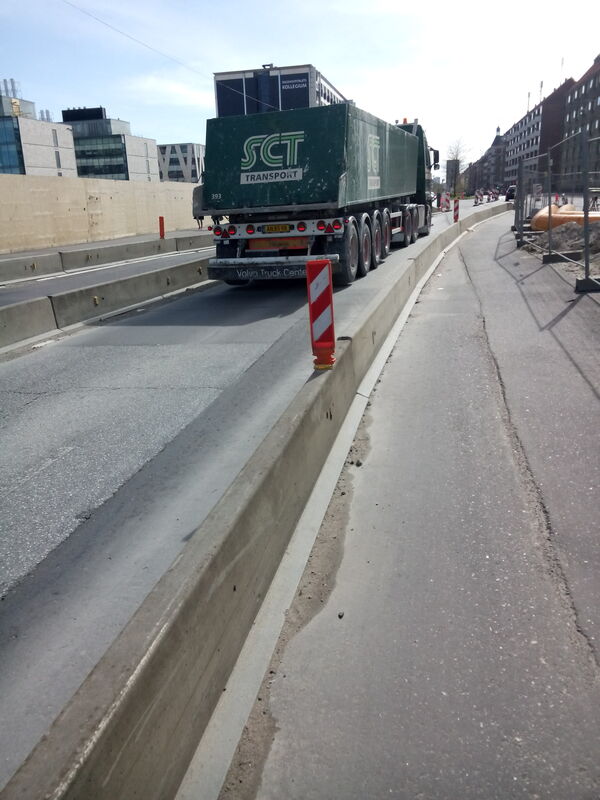 I take the Sterna chicks cycling everywhere and it has got to the point I almost don’t know how to get around the city without my bike. 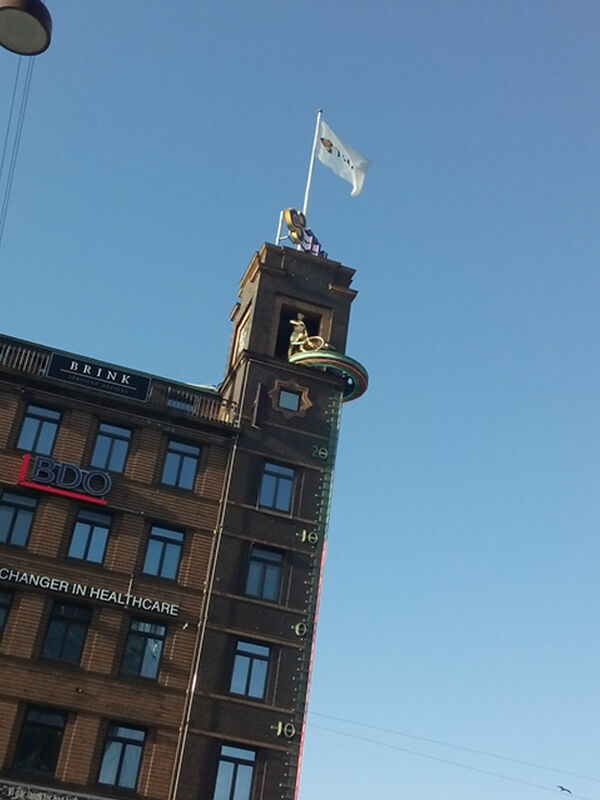 This is not unusual in Copenhagen. Cycling culture is one of the things I love most about living here. 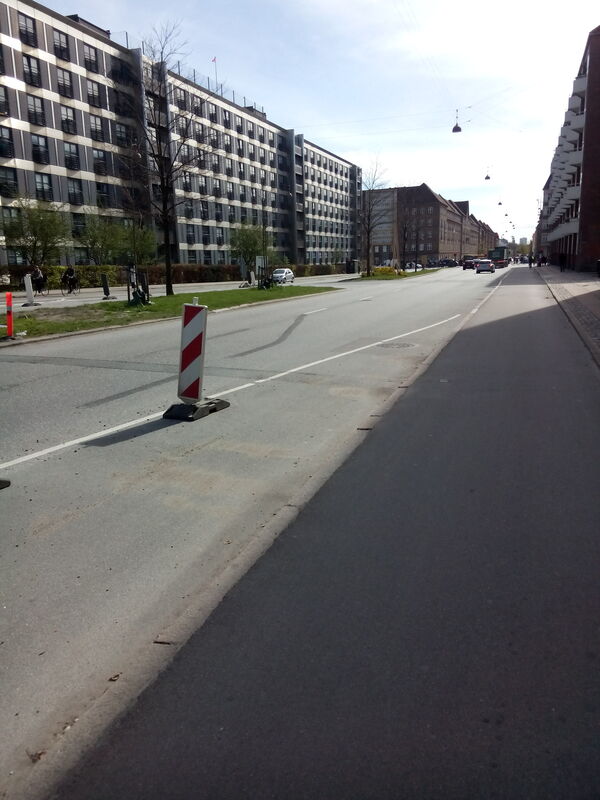 The wider benefits of being in a biking city are far-reaching and far too many mention here (but check out Copenhagenize for an inspiring run-down). I have always cycled everywhere, and in fact have never owned my own car, though I can drive and even enjoy it – albeit on congestion free roads such as you might find in the North of Scotland. However, the vulnerability of cyclists in the UK has come to disturb me ever more. Especially since the very tragic death of Dr. Kat Giles, a polar scientist I had met a couple of times, under the wheels of an HGV in London on a route she had cycled for ten years or so back in 2013. 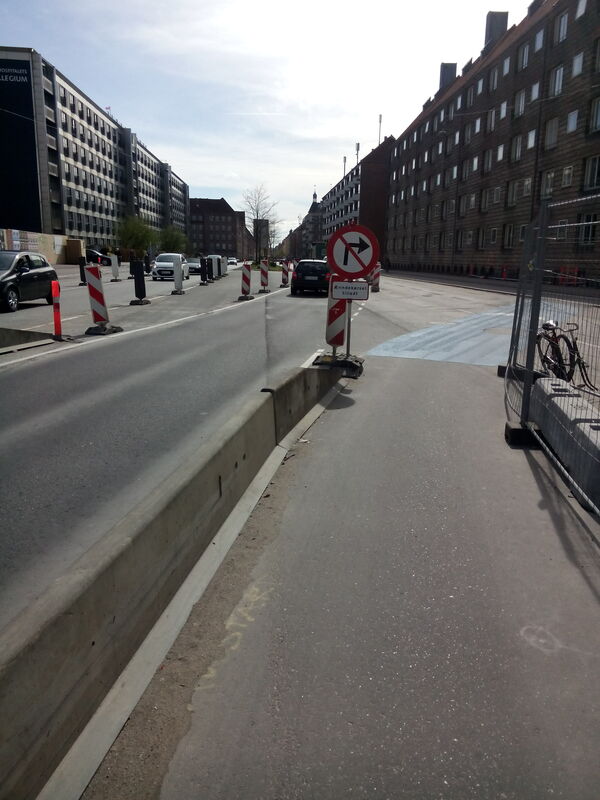 I am so accustomed to the safety of cycling in Copenhagen that I think I would find it hard to go back to cycling in the UK or anywhere else without good bike infrastructure (including separated bike lanes). I would certainly not let my 4 year old bike to the nursery as I do at present (and for which a poor child was threatened with having their bike confiscated recently in the UK, but I digress). Even my mother (hi Mum!) 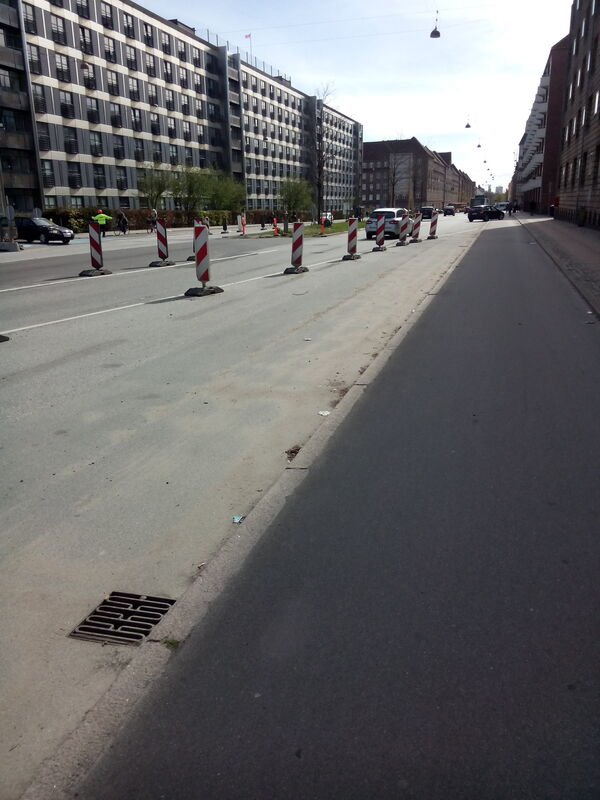 has been witnessed riding a bike in Copenhagen. I have video evidence. 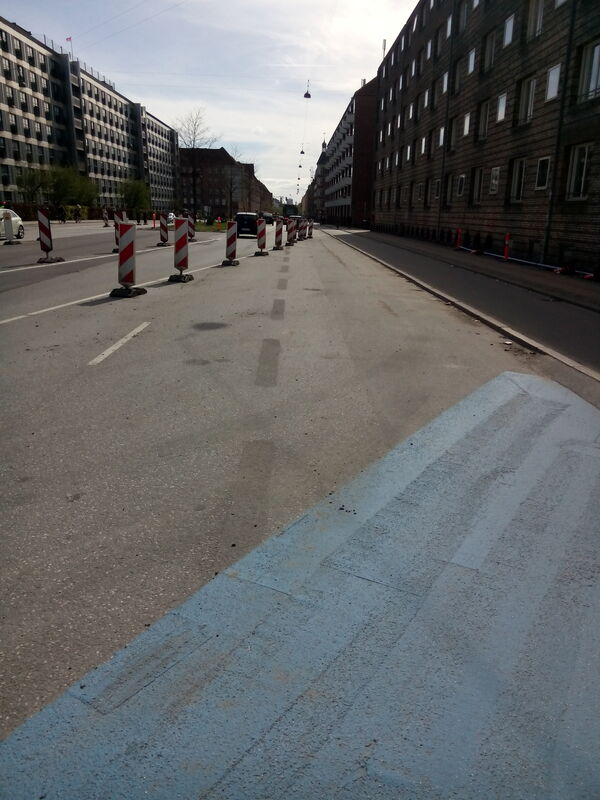 The pavement and separated bike lane have been taken over by the construction, shielded by the link fence on the right; the near side lane on the road is now a shared bike/pedestrian route and the whole thing is smoothly transitioned in and out with the assistance of some blue paint and traffic bollards on the road and of course temporary tarmac ramps to help cyclists get over the kerb at both ends of the building works. 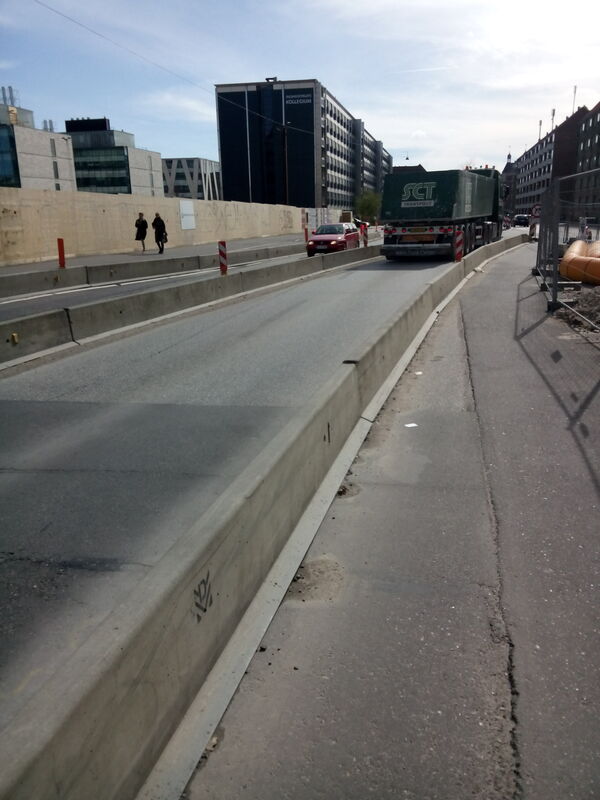 The same is true on the other side, so the road has temporarily narrowed to a normal road before widening again to a dual carriageway. 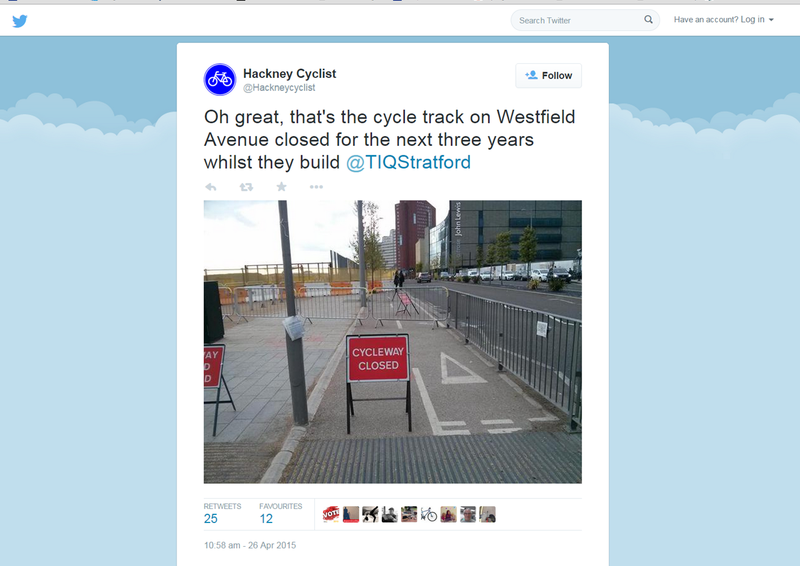 You see, it really isn’t hard to do major building works and keep the bike traffic flowing. 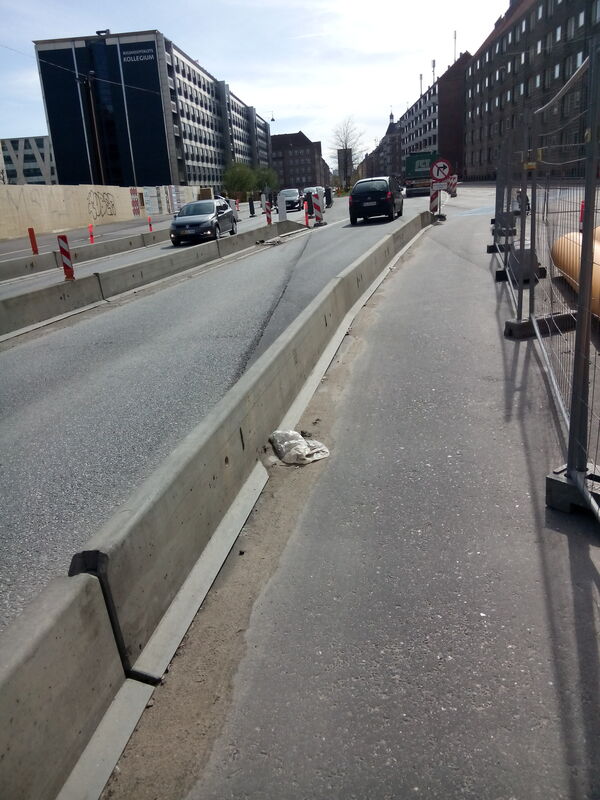 The thing is, this isn’t a unique situation, even small building works where the bike lane and/or pavement is likely to be blocked is treated like this in Copenhagen. It’s about treating all people on the move with respect and it’s something a lot of cities, and countries could learn from when thinking about road safety, sustainable transport and above all quality of life for everyone. 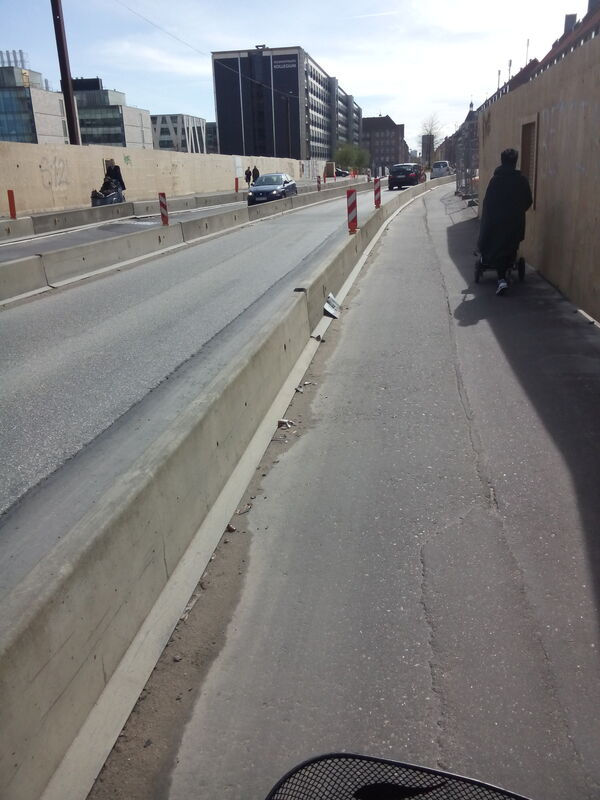 This is what #spaceforcycling really looks like. I was very honoured to be asked to give a short talk last week to some students at the Danish Technical University. The subject was ice sheet modelling and climate at DMI where I work in the Research department, climate and Arctic section. I thought this could be interesting for others to look at too, so I have uploaded the powerpoint presentation on my academia.edu page. In the presentation I try to explain why we are interested in climate and ice sheets and then give a brief overview of our model systems and the projects we are currently working on. 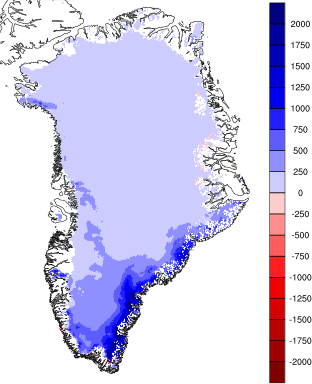 We are mainly interested in the Greenland ice sheet from the perspective of sea level rise. If we are to climate change we need to know how fast and how much of Greenland will melt and how this will change local and regional sea level. There are also studies showing that increased run-off from the ice sheet may change ocean circulation patterns and sea ice. There is lots more stuff to look at so feel free to download it. I end up with a very brief overview of our biggest project at the moment, ice2ice. This is a large ERC funded project with the Niels Bohr Institute and partners in Bergen at the Bjerknes Climate Research Centre. I may write a brief post on ice2ice soon if I get chance. It’s a really interesting piece of work being focused on past glacial-interglacial climate change rather than present day or the future and I think we have potential to do some great science with it. At the risk of seeming like I’m blowing the DMI trumpet (something rarely done or even really seen as socially acceptable in Denmark! ), I think we at DMI have a lot to be proud of. We are a small group from a small country with limited resources but my colleagues have pioneered high resolution regional climate modelling of the Greenland ice sheet and the development of coupled climate and ice sheet models at both regional and global scales. 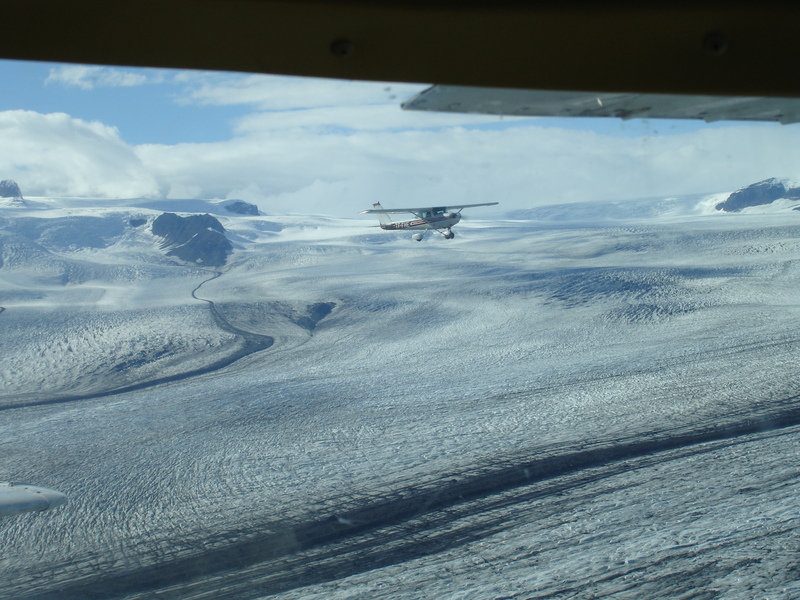 I was brought in as a glaciologist to work on the interface between ice sheet and atmosphere, needless to say I have learnt a hell of lot here. It’s been an exhilarating few years. If you have any questions, I will enable comments for this thread (but with moderation so it may take a while for you to see it). shot by Jason Amundson, University of Alaska Fairbanks at Jakobshavn Isbrae in West Greenland. There are some really powerful visualisations in this short 4 minute video from Carbon Visuals about the sheer amount of energy, mostly from fossil fuels, that we have come to rely on. I think it really shows what a huge challenge we face in terms of both energy policy (we’re burning through it as if it will never run out) and climate change. I am not really convinced by CCS (Carbon capture and storage) though, it seems to require a very large amount of energy just to make the CCS process work (around 30% of powerplant output if I recall correctly) burning through our fossil fuel supplies even faster. Several programmes I have seen recently (for example, the excellent Planet Oil from the BBC, now probably available on youtube, made by Professor Iain Stewart, head of the RSGS) make the point that our civilisation is basically burning through the easy energy. If we don’t invest in developing other sources now, it will be so much harder in the future. Those other sources, realistically speaking, have to include nuclear. As Brian Cox points out in his beautifully filmed epic Human Universe, this will also have to include nuclear fusion. I think the best resource I have found to think about some of these issues is Without Hot Air, an excellent book by David MacKay and available here for free download or you can buy a paper copy in the usual places. I mowed the lawn for the first time last weekend. This mundane task was made much easier by these beauties, smiling over me. I believe the variety is called “Jet fire” which seems highly appropriate. 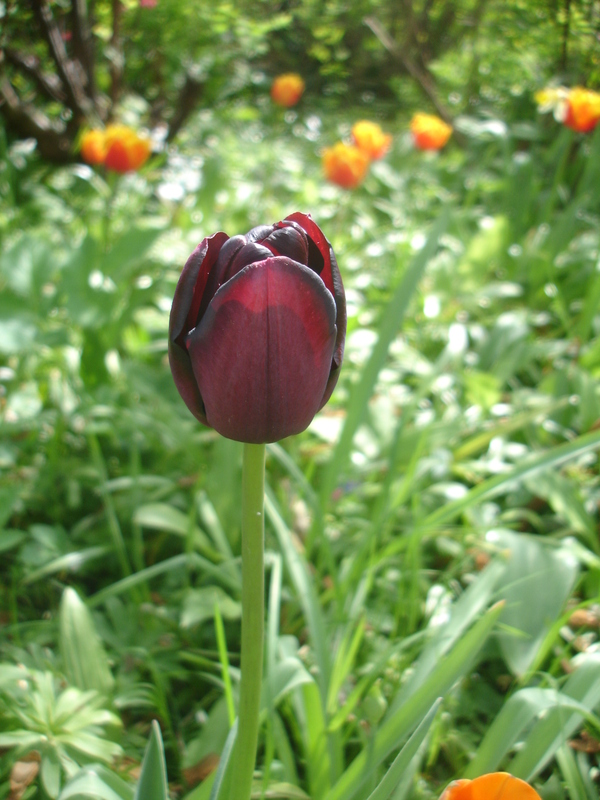 I had never really appreciated tulips until a few years ago when we planted some “queen of the night” – dramatic dark purple flowers that really caught your attention, especially when combined with vivid orange tulips; the glaucous foliage of both setting off the combination beautifully. Then a few trips to Holland happened, I visited the famous Keukenhof gardens and the bollenstreek. and I learned to love the tulip. Eventually when I got married I even had yellow tulips in my bouquet (though mainly because they were in season and I wanted to have locally grown flowers). This year we also have this variety in a pot, though I’m not sure what they are called. Their bright colours really make a difference after the long dark winter and I am so happy to see them come up again – still glorious even in a second year. 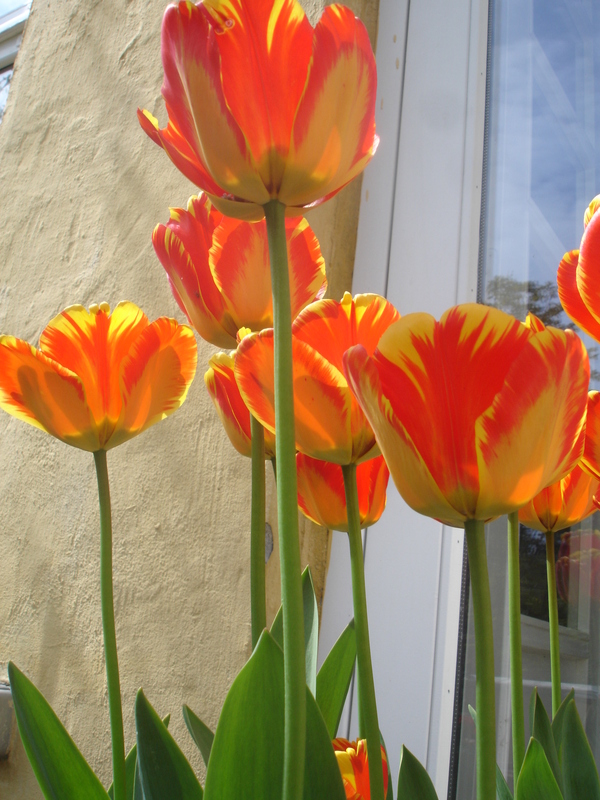 More than any other spring flower, tulips for me embody the transition from winter to spring to summer. As I had my camera out in the garden I could not resist taking a few more photos. 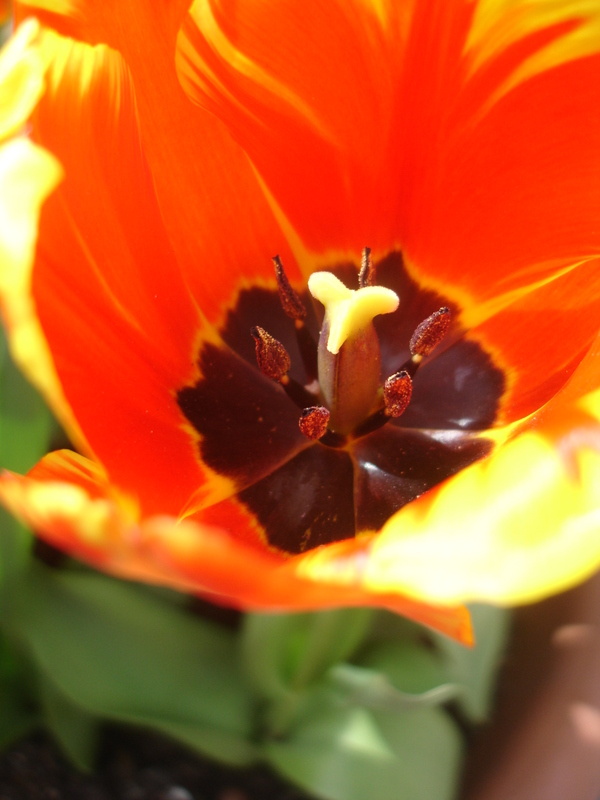 The internal parts of the tulip are extraordinary in close up. The stamen with the fine powder pollen on the anthers, surrounding the pistil and the deep black of the central petals have always reminded me of big dramatic bumble bees. It is not surprising to me that Elizabeth Blackadder, has chosen red and yellow tulips for some of her most dramatic flower paintings. They simply sparkle with life and vitality. They flower themselves to exhaustion after a couple of years, often requiring 5 years or more to come back to flowering. Truly a passionate plant. And yet, the frilling and streaking of the tulip petals is actually caused by a virus. This must be a rare case of a pathogen enhancing natural beauty. I had assumed that these were a modern variation added by skillful breeders but on a recent trip through Schiphol airport in Amsterdam I had the opportunity to visit the Rijksmuseum’s Dutch Flowers exhibition. 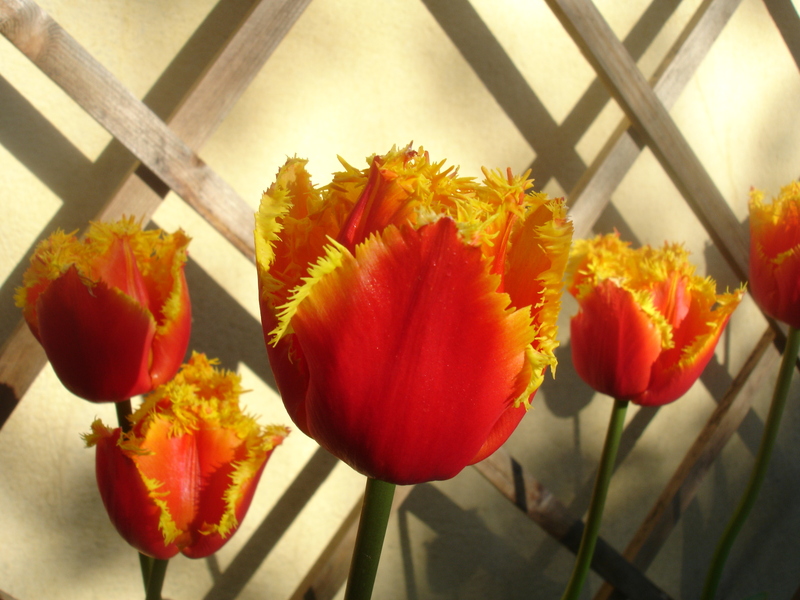 There, in one of the first paintings I looked at from the 17th century was a tulip beautifully streaked with colours. An anonymous painting of the most expensive tulip ever sold, the Semper Augustus. I had seen Dutch flower paintings before, having been inspired to look up a few after reading The Morville Hours by Katherine Swift (a beautiful book, a meditation on time passing and the natural world but touching on many subjects). However, I had never appreciated how vividly beautiful such paintings were until seeing them in reality. Unfortunately, the mosaic virus that causes such beautiful patterning weakens the bulbs through the generations to such an extent that eventually they no longer reproduce, and many of the original varieties from the 17th century no longer exist other than in oil paintings. Note: I haven’t written anything on this blog for a long time for which I apologise – a combination of too little time due to work/family commitments and a lack of inspiration, but I have good intentions at least to continue posting here items that interest me semi-regularly over the summertime. Thanks for reading. Note: I have also had to change my web address to sternaparadisaea.net since my .com domain expired this year and, due to illness I did not renew it in time.